As is rightly said that a nation can progress only if its population is educated, which includes both the sexes of the society. In many parts of India, there are still people who believe that investing in a girl’s education is a wastage of money. It is a disturbing fact that even after making so much progress, several citizens of our nation still find ways to block or disregard a girl’s progress academically. One of the major reasons for which is financial constraints and scholarship for girls is a viable solution to resolve this concern. This brings us to a stage where we must realize that much needs to be done to improve the academic situation of the female population of the country. Our government, both state and central, along with several other organizations are working day and night to change this scenario. Grants, aids, allowances, stipends and scholarships for girls are some of the solutions that they have come up with. Taking the financial burden off the chest of parents living in poor conditions or rural areas works like magic where a girl’s education is concerned. So, this seems like an effective method. And, if you are confused about which scholarship for girls to look for, then here’s a list compiled especially for your perusal. These scholarships will make you realize that if a family is not sending their girl child to school due to monetary concerns, then there is actually help available which will help to educate your child. 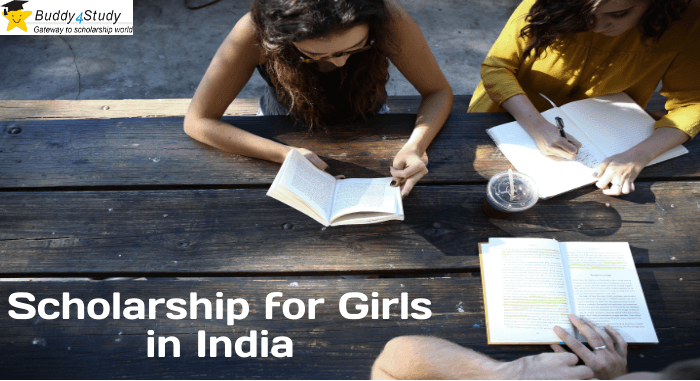 Scholarship for Girls in India: Gender parity catching on! Initiated by Dr. Reddy’s Foundation to encourage girl students to go for higher education in Science subject, this scholarship offers INR 2,40,000 for three years (INR 80,000 per year) to competent class 12 passed girl students. If you wish to apply, the last date to submit the application is 15 August 2018. Started by the Government of Gujarat, this scholarship is for those girls who belong to SEBC category of Gujarat state and are studying in class 11 to Ph.D. Under this scheme, selected students will receive up to INR 280 per month as scholarship. The last date to apply for this scholarship is 15 August 2018. This scholarship is offered by Wipro Consumer Care and Wipro Cares. It caters the needs of underprivileged girl students of Andhra Pradesh, Karnataka and Telangana. Around 900 girl students stand a chance to benefit from this scheme. This scholarship offers an amount of INR 24,000 per year to selected class 12 passed girls. If you wish to apply for this scholarship, do it before 15 August 2018. Launched by the Maulana Azad Education Foundation (MAEF), Ministry of Minority Affairs, Government of India, this scholarship is for girls of minority communities (Muslim, Christian, Sikh, Buddhist, Jain and Parsi) who are studying in class 9 to 12. In order to be eligible, the students must have a family income of less than INR 2 Lacs. Also, selected students will get up to INR 12,000 as scholarship amount. So, if you want to apply for this scholarship for girls, you must do it before 15 September 2018. Initiated by the Social Justice and Special Assistance Department, Government of Maharashtra, Savitribai Phule Scholarship is for girl students of Maharashtra who are studying in class 5 to 10. The students must belong to SC, VJNT or SBC category in order to be eligible to apply for this scholarship. Under this scheme, selected students will receive INR 100 per month for 10 months. Interested students can apply for this scholarship before the deadline 31 December 2018. The above-mentioned scholarships for girls are just a few examples from a vast pool. So, if you want to know more about such scholarships, register with Buddy4Study. It is India’s largest scholarship platform where you can easily browse through its list of scholarships. Also, apply for the ones matching your requirements.